Амфибия, двухмоторный цельнометаллический моноплан-парасоль. Создан в отделении "Сикорски эйркрафт" корпорации "Юнайтед эйркрафт" под руководством И.И. Сикорского. Военный вариант пассажирской амфибии S-43 "Бэби клиппер", проходившей испытания в 1935 г. Серийное ДальшеMore>>> производство S-43 начали в 1936 г. В следующем году стали строить варианты этой амфибии, принятые на вооружение армейской и морской авиации США. Всего вооруженные силы получили 23 машины этого типа. - OA-11, реквизированный армией пассажирский S-43 с моторами R-1690-S2C. Стрелкового вооружения ни один самолет не имел. В предвоенные годы машины семейства S-43 эксплуатировались американскими армией, флотом и морской пехотой. В 1942 г. JRS-1 привлекались к противолодочному патрулированию у западного побережья США и Гавайских о-вов, но в основном все эти машины летали как транспортные. Последний самолет (OA-11) был приобретен армией в марте 1942 г. JRS-1 для флота прекратили строить в 1939 г.
Морская авиация США сняла JRS-1 с вооружения в конце 1942 г., ВВС армии - в конце 1945 г.
Чилийские ВВС эксплуатировали два S-43 гражданского варианта до конца 1938 г.
Моторы, количество х мощность:||2х 750 л.с. S-43 проектировался на базе S-42 и имел меньшие размеры. В качестве силовой установки использовались два звездообразных Pratt & Whitney R-1690 Hornet мощностью по 750 л. с., а оперение было не двухкилевым, а с одним килем. В стандартном варианте самолет брал 15-18 пассажиров. Первый полет S-43 выполнил 1 июня 1935 года, всего же компания Сикорского построила 50 S-43 и еще три были построены без шасси. Вариант S-43W оснащался двигателями Wright Cyclone и имел однокилевое хвостовое оперение, а варианты S-43B и S-43WB имели двигатели Pratt & Whitney или Wright и двухкилевое хвостовое оперение. "Pan American" приобрела 14 самолетов и была крупнейшим эксплуатантом машин данного семейства, применяя их на маршрутах в Латинской Америке. Среди других заказчиков - "Air France", гавайская "Inter-Island Airways", голландская "KNILM" и авиакомпании Чили, Китая, Норвегии и СССР. ВМС США также приобрели данные самолеты. В 1937-1939 годах ВМС закупили семь, а затем еще 10 S-43, включая два для авиации КМП США. Самолеты получили обозначение JRS-1, имели экипаж из 1-2 человек и использовались в качестве вспомогательных транспортных - могли брать на борт до 18 пассажиров или груз. Самолеты, полученные авиацией КМП США, входили в состав 1 -й и 2-й разведывательных эскадрилий авиации морской пехоты. Восемь машин, поступивших в авиацию ВМС США, входили в состав 1-й разведывательной эскадрильи, дислоцированной в Сан-Диего. 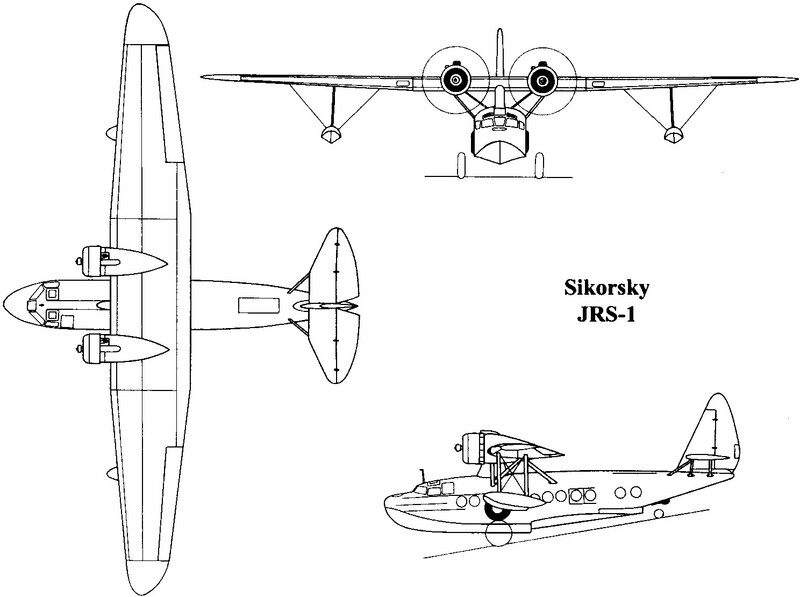 После 1941 года в эксплуатации оставался лишь один JRS-1. Армия США располагала четырьмя вспомогательными транспортными самолетами данного семейства - они обозначались OA-8/OA-11. DURING a recent visit to America the writer was invited up to Bridgeport, where the Sikorsky amphibians are made. After seeing aircraft factories in most of the European countries it was particularly interesting to have an opportunity of inspecting the methods of the U.S.A.
Sikorsky's have been much in the limelight recently by virtue of the performance of their S.42, the large flying-boat which has been built for Pan American Airways to use over their ocean routes. Three of these have been delivered, and seven more were to be seen under construction; incidentally, these later models will have a gross weight of 41,000 lb. instead of 39,000 lb. as hitherto, so that the ratio of gross to tare is 1.95, which means that this boat carries 95 per cent, of its own weight. With a load capacity of this size flying begins to look as profitable as any other means of transport. Amphibians (or perhaps my American friends would prefer amphibions) have, however, always been Igor Sikorsky's chief interest, and during my visit I saw the latest of these, the S.43, nearing completion. This aircraft has now flown and it seems very probable that the estimated figures are likely to be fully substantiated, in which case operators all over the world will undoubtedly be very interested indeed. With a ratio of gross weight to tare weight of nearly 1.7 the percentage load carried is unusually high for an amphibian. The figure, indeed, is reasonably good for a land machine, but in this case the operator will have the great advantage that his aeroplane can be used from both land and water bases. The S.43 is roomy inside, with a standard cabin arrangement of from fifteen to twenty-five passengers and a crew of three. The power plant is two Pratt and Whitney S1EG geared "Hornet" engines of 750 h.p., which drive Hamilton Standard constant-speed airscrews. Structurally there is very little radical departure from accepted Sikorsky practice. The wing, which tapers heavily in plan and profile, has a span of 86 ft. and a total area of 780 sq. ft., giving a loading of 24.34 lb./sq. ft. Built of anodically treated duralumin, the wing is virtually of monospar construction in that the two spars are joined top and bottom with a flush-riveted duralumin skin to form a box, which for stress purposes is treated as a unit. Behind this spar the duralumin ribs are covered with doped fabric. The whole of the trailing edge of the wing between the ailerons forms a flap which is used for both take-off and landing, while the ailerons themselves are dropped 10 deg., without affecting the total movement, thus adding to the effective flap area. The flap is hydraulically operated, a small electric motor working the hydraulic pistons, and is returned to the neutral position automatically. The rudder is balanced by an automatic trailing-edge servo tab. Widespread use is made of extruded light alloy sections for such parts as wing spar booms, internal struts, and stringers. The hull is of duralumin and is anodically treated everywhere. American practice employs anodic treatment not so much for prevention of corrosion itself as to form a somewhat absorbent surface to which protective paint coverings will adhere. Much use is made of open extruded sections so that inspection is simple, and any signs of corrosion can immediately be detected. Of semi-monocoque construction, the hull is divided into five main watertight compartments, with doors in each bulkhead. Any three of the five compartments will keep the S.43 afloat, in addition, the wing is capable of being sealed to form additional buoyancy chambers in the event of a forced landing at sea with a damaged hull. The retractable undercarriage is very neat. It is pulled up with a form of parallelogram motion into a watertight compartment in the centre portion of the hull, and the wheels drop in recesses which leave one half of the thickness outside; but, due to the shape of the tyre, the drag of this portion is not very large. Among details, it is interesting to note that the large anchor is non-magnetic. Both sides of the undercarriage are interchangeable, and may readily be removed if it is wished to operate only as a flying-boat. Sealed ball bearings are used in most places for the controls. Fuel is carried in riveted duralumin tanks behind each engine, and each tank has a large dump valve. Tanks and engine mountings are interchangeable. Lux CO2 pressure fire extinguishers are fitted in each engine nacelle. As it is a high-wing monoplane, the S.43 will appeal to passengers much more than do low-wing types, as they will be able to see the country over which they are passing. Having a payload which should make air transport economical even with an amphibian, it may well start a new regime whereby operators running to large cities will use an amphibian for their last stage, making it possible to land in the heart of the city on the river (which always seems to be there) instead of fourteen to twenty miles outside, as is now so often necessary. The more general use of the amphibian may also be a means of bringing the insurance rates down, due to the increased safety factor of being able to alight on either land or water. LENGTH 51 ft. 2 in. BEAM OF HULL 7 ft. 6 in. CHORD, MAX. 11 ft.6 in. WING AREA, TOTAL 780 sq.ft. 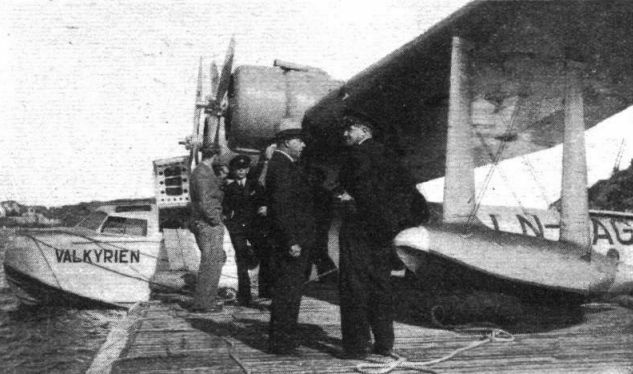 WING LOADING 24.34 lb./sq. ft.
CRUISING SPEED, 70% H.P. AT 1,000 FT. 105 m.p.h. CRUISING SPEED, 75% H.P. AT 8,000 FT. 181 m.p.h. TOP SPEED, 7,000 FT. 200 m.p.h. STALLING SPEED, SEA LEVEL 65 m.p.h. Top SPEED, ONE ENGINE, 7,000 FT. 125 m.p.h. INITIAL RATE OF CLIMB 1,250 ft./min. 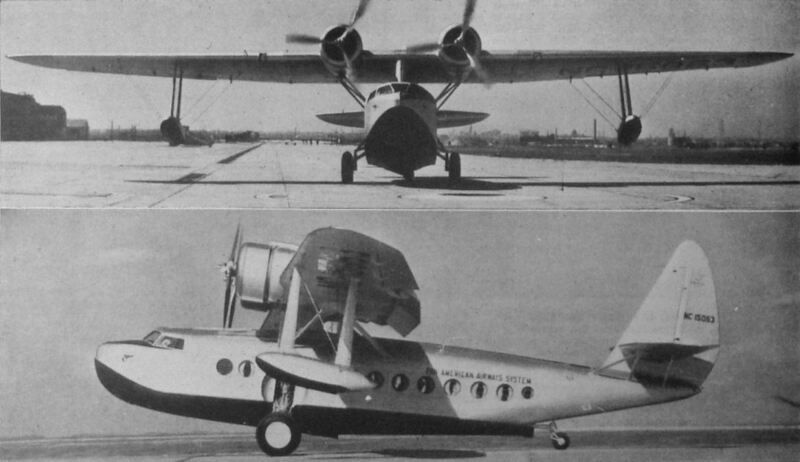 The Sikorsky S-43 Commercial Amphibian (two 750 h.p. Pratt & Whitney "Hornet" engines). SEA LAWYER AND WARRIOR: A contrast in shapes and sizes is offered by this pose of a Vought V-143 single-seater fighter in the shade of a Sikorsky S-43 amphibian. 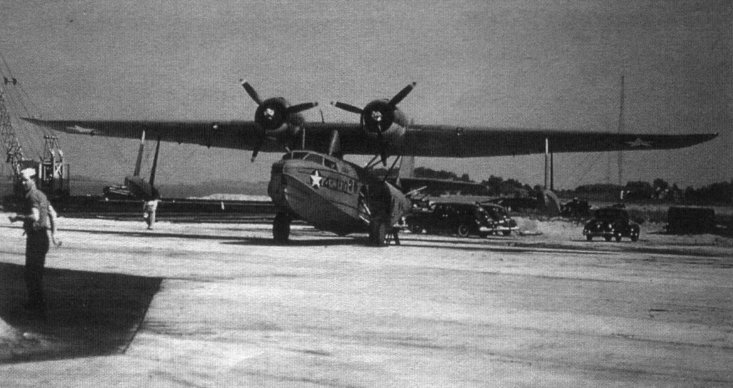 The V-143 does 280 m.p.h. with a P. and W. Twin Wasp Junior and the amphibian 190 m.p.h. with two Hornets. Меньший по размерам S-43 часто называли "Mini Clipper" или "Baby Clipper". Характеристики его были в целом схожи с S-42. INTERNATIONAL AMITY. - Passengers, at Accra, enter an American Sikorsky S/43 (two 750 h.p. Pratt & Whitney "Hornets") which belongs to the Cie. Aeromaritime, by a hatch aft, with the help of steps. Экипаж самолета-амфибии S-43. Третий справа - А.Н. Грацианский. 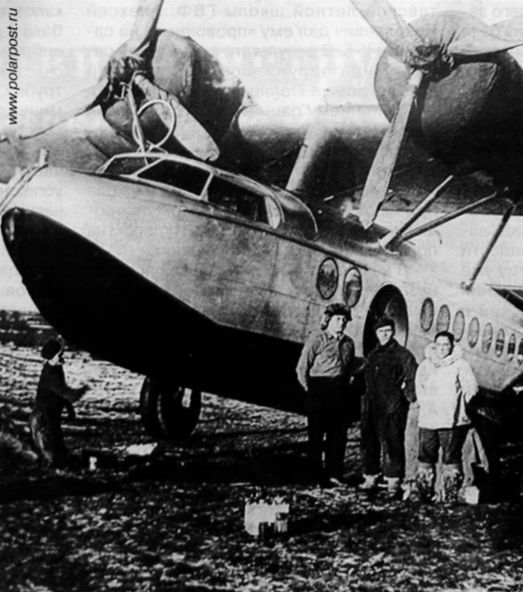 Аляска, сентябрь 1937 г.
AMPHIBIOUS COLLABORATION: When D.N.L. eventually work on the Newcastle-Stavanger service it is probable that a Sikorsky S.43 will be used. This photograph shows the company's first machine of this type at Stavanger. In the foreground, with D.N.L. 's agent, is Mr. Bernt Balchen, the famous pilot. FRANCE TAKES BRITISH TRADE. 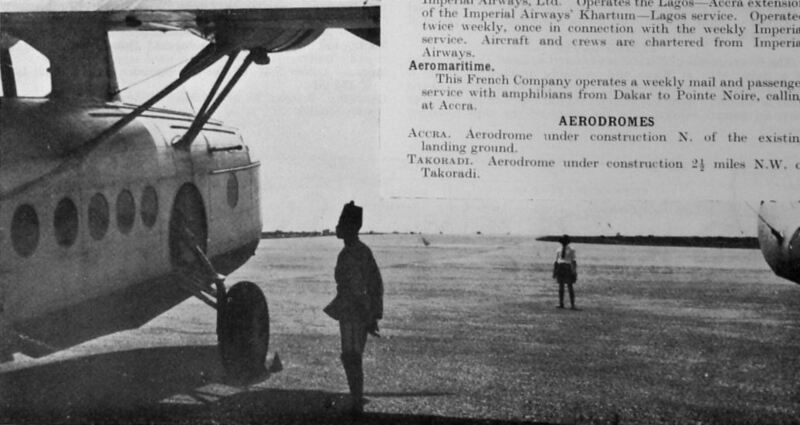 - An American Sikorsky of the Cie. Aeromaritime on the runway at Accra. IN FRENCH GUINEA. - Refuelling at the excellent new aerodrome at Conakry for the 415-mile stage to Dakar. Амфибия JRS-1 из эскадрильи VJ-4 на аэродроме в Майями, февраль 1943 г. The now famous Sikorsky S.43 amphibian, this particular version of which having been sold for work in Norway, where the type should be particularly valuable. 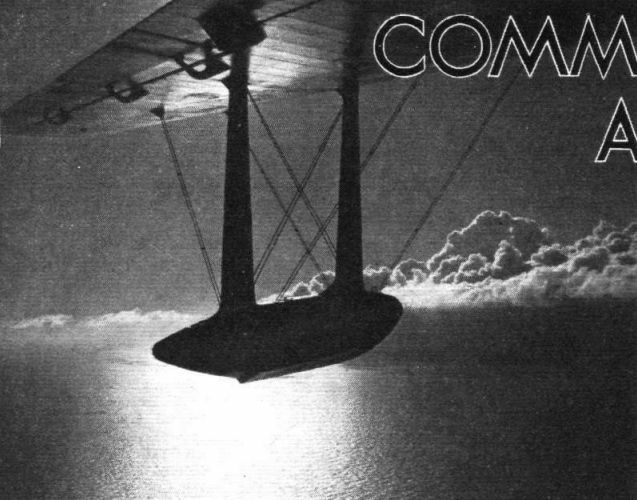 HONOLULU BOUND: Such a prosaic excrescence as the wing-tip float of a Sikorsky S.43, used on the Hawaiian inter-island service, assumes a dramatic aspect against this Pacific background.